The number of Aho recordings has grown substantially since my 2009 MusicWeb survey, The Music of Kalevi Aho. Initially, that focused on BIS releases, as the label’s championed this composer’s work from the start – eClassical lists 35 albums so far – but others are showing interest, too. Which is why we’ve now set up a dedicated, easy-reference index, with links to every single Aho review published by MWI. Our feisty Finn, 70 this year, is a fast worker – I reviewed three of his latest albums just a few months ago – so all credit to BIS for recording his new pieces with commendable speed. Even then, there’s still a lot waiting in the wings. As so often, this trombone concerto is the result of a specific request, in this case from Jörgen van Rijen, principal trombonist of both the Concertgebouw and the Lucerne Festival Orchestra. 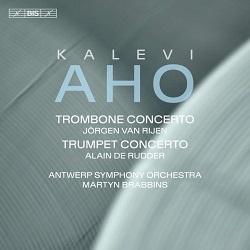 The trumpet concerto, which had a longer, more complicated gestation, ended up as a three-way commission from the Finnish symphonic wind orchestra, Sisu, the Helsinki-based Guards Band and what was then the Royal Flemish Philharmonic (now the Antwerp Symphony Orchestra). Alain De Rudder, the soloist here, is the ASO’s principal trumpet. Both players are new to me, but conductor Martyn Brabbins certainly isn’t. Well known in 20th-century repertoire, he’s given us some fine recordings; for me, though, one of his greatest achievements is that 2011 BBC Prom performance of Havergal Brian’s monumental ‘Gothic’ Symphony (Hyperion). Aho’s Symphony No. 9 (BIS-706) has a prominent trombone part, so it’s no surprise that the solo writing in this concerto is so assured, the expressive range so wide. The sound has startling presence and power, too, but then engineer Andreas Ruge is working in the congenial acoustic of the orchestra’s old home, DeSingel, rather than the less amenable ambience of their new one, the Koningin Elisabethzaal. The band’s certainly in good form here, Brabbins a sure and steady guide. As for van Rijen, his technique is beyond reproach. Most rewarding, though, is the fact that Aho’s still at the top of his game, and that there’s so much to relish in this splendid score, not least in the Presto, with its blend of virtuosity and good humour. But it’s the deeply felt Adagio that makes the strongest impression, the trombone’s mournful sonorities superbly caught. As for the now ebullient, now enigmatic finale, it brims with energy and imagination. No question, that’s one of the finest Aho pieces I’ve heard in a long time; indeed, it whetted my appetite for the coupling, written a year later. It’s a darker, more brooding work whose solo part brings to mind the urban solitude of Michael Daugerty’s Sunset Strip. That said, the dirge-like moments of the Misterioso are something else entirely. Highly atmospheric music, this, with telling touches that tease the ear at every turn. The buoyant Vivace finds De Rudder at his animated best, his prowess a wonder to behold. Happily, it’s not just about showmanship, as there’s plenty of finesse and feeling to be had as well, not least in the lovely Intermezzo e cadenza. And, thanks to engineer Nora Brandenburg, perspectives are ideal, the level of fine detail simply breathtaking. The closing Capriccio, rhythmically adept and replete with so tantalising timbres, is a perfect sign-off, for it left me longing for more. What a gorgeous album this is, and how committed the soloists and orchestra. As for Brabbins, he seems a good fit for this composer’s music, just like Osmo Vänskä and John Storgårds before him. Indeed, I very much hope he’ll feature in forthcoming Aho releases. The composer’s clear, unpretentious liner-notes are a regular, most welcome bonus. Two premium-quality concertos, stylishly played and magnificently recorded; Aho and BIS at their considerable best.